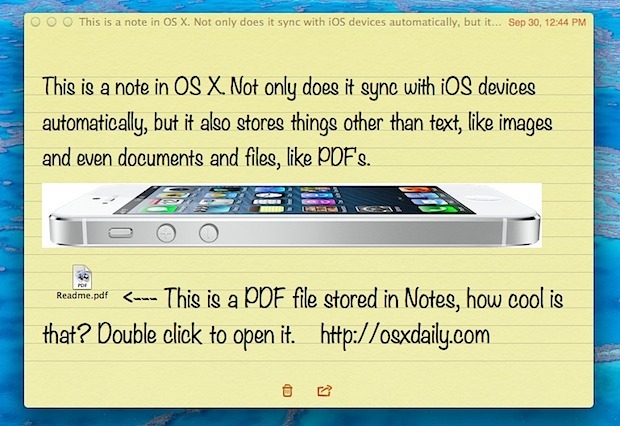 Notes has been around in iOS for a while, but it’s new to the Mac with OS X Mountain Lion, and if you think it’s just a place to keep track of a few thoughts you’re greatly underestimating the usefulness of this app. In fact, Notes can function as a powerful cross-platform clipboard, because not only will it store your quick text notes, but Notes can actually store just about anything else too, including images and even documents and files – yes, files like PDF documents, zip archives, and much more. The notes are instantly accessible with full contents from other Macs. After the note has synced with an iPhone, iPad, or iPod touch, you can see the the text notes from iOS too. There is a limitation on viewing all data from the iOS side, since rich note formats are (currently) not entirely viewable on the iOS side. You must have iCloud set up to use the same Apple ID on each device that you want Notes to sync between, whether it’s a Mac, iPad, iPod, or iPhone. If you’re having any issues with the syncing, be sure to check that out first, and be sure iCloud is enabled. You will find that not all image content is going to sync everywhere, specifically between a Mac and iOS device, because the iOS based Notes apps do not support direct image embedding. That is almost certainly a limitation that will be lifted soon as the iOS Notes app gains support for images and multimedia content, but for the time being do be aware that images, video, and multimedia content will sync best between Macs for the time being. This is really nice and it makes me feel like we’re moving closer and closer to the end of a traditional filesystem. Obviously we will all still have files, but the way we store and access them is changing and diversifying. Imagine if you could send this Note out to a group of people, attached with a few files. It’s almost like email at that point, with files stored within knowledge references. I didn’t read it well. You really should upgrade. Mountain Lion is a great update. My iCloud account is my own email — not an iCloud.com email. Is there still a way to make this work? It keeps asking me to start an iCloud.com email — which I don’t need or want. Its not email dependent, just use same iCloud account on all Mac and iPhones. Go to iCloud settings and turn on notes documents etc. You must use the same iCloud account, that’s all it takes. Tried that. It doesn’t let you… on my phone or on my Mac. Says the account has to be iCloud.com. Unless I’m missing something somewhere. Very possibly. So, I go to Sys Preferences, click iCloud and check the Notes box. It then brings up a box that says choose an iCloud email address to use. My iCloud account is set up with my own email. If I try to enter that email it tells me it’s an invalid iCloud account. Everything else — contacts, calendar — syncs fine. But Notes won’t seem to do it. This I used before Mountain Lion when I synced my iPod Touch via iTunes. It is such a great feature!… The problem now is, unless you have iCloud you can’t sync via iTunes… I don’t have iCloud and I don’t like not having the option of using one or the other. Apple should allow this feature like it was before Mountain Lion. I totally agree. Do not understand why syncing via USB cable has been removed for notes under ML. I will never use ICLOUD or a similar system. Are you sure about this? Images and files don’t sync to my iOS devices, only text. Where the image or file should be (when opening the note on iOS), I get a ‘paper clip’ icon which can’t be clicked or opened. I’m using iCloud, mountain lion and iOS 6, so why isn’t it working for me? Same for me Stephen – looking forward to the response to you! Same here.. only Text sync’s to iOS device (iPhone 5).. any attachments are represented by a small paperclip that does not open upon tapping. Not sure why the author would say it works on iOS though.. guessing?? Images sync for me, but not files. With files i get the paper clip icon too, images work fine though and so do emoji. Same for me, Notes syncs text fine to iPhone and iPad from ML but just paper clips for the files? I am finding the same , text syncs to ios devices fine but not attachments . Tried png , JPG and PDF but none sync through to ios devices. im running latest mountain lion and ios 6 on new ipad and iphone 4s. How about iCloud running on a windows 7? I could not make it work so far, any advices? I can’t test on windows, but you should check out iCloud.com because that works for me. It should be mostly platform/browser independent. Same problem here. Both PDF and jpg’s show up on iOS in the Notes app as a paperclip, and can’t be interacted with. I think this was a leap of faith on the part of Mr. Horowitz. One might assume that since Notes are synced, and files and JPEGs can be put into a Note, then the files and JPEGs would have to be synced, too. But it seems Apple was too smart for us. I guess I can see this — imagine if you dragged, say, a movie file into a note. Would you want 25GB of data moving into the cloud? Syncs fine between Macs for me, did you try different Macs? Yes this article is completely misleading. iOS only displays text in Notes. Why even right this article. Worthless. This would be great … if it worked. Unfortunately, like many of the above commenters, I am not getting this to work for my iPhone. Macs and iCloud.com both show attachment documents and images, but my iPhone 5 and iPhone 4 both show mysterious-unclickable paperclips that don’t do anything. Perhaps an iPad has better luck, but I wish I could get this to work on my iPhone. What about people who are not using ICLOUD? Personally, I do not wish to have my work located in third parties and would like, simply, to Sync using the USB cable like in the past. Any ideas? This is all very good, but as long as I cant share my notes with my girlfriend, familiy friends – this isn’t very smart. Why would you use the same Apple account on other people’s phones? This is wonderful for a cross-Mac clipboard, but for Mac to iOS it doesn’t serve much use beyond the simple notes form. At least in the iOS versions I use (6.0) it does not support this feature on the iOS side outside of text. I think the article needs to be clarified. Correct, there is a limitation with current stock iOS Notes app that prevents rich notes from being viewed. Article has been updated to reflect this. this worked yesterday up until I upgraded to the most recent itunes update and icloud2. dam it apple. I agree with those that would insist on having this work over wired connections and not through any sort of cloud/ third party servers. It’s a pity as it would be very useful and give us true file transfer capabilities that iOS currently lacks. Nice trick. But I still prefer Dropbox. A bit of a workaround but notes with images can be viewed on IOS6 iPhone if you copy the complete note to a draft email and view it on the phone in the Mail app. Formatting isn’t brilliant though.